Harlingen CISD has been awarded a $1.5 million 21st Century Community Learning Centers, Cycle 10, Year 1 grant by the Texas Education Agency. This federally-funded program (also called Texas Afterschool Centers on Education or Texas ACE), establishes centers that operate before and after school, as well as during the summer. HCISD is one of 51 entities to be selected to receive the grant for the 2018-2019 school year. The robust award will help fund high-quality extended learning opportunities outside of the regular school day for ten campuses, which include all five HCISD middle schools as well as Bonham, Crockett, Lamar, Long, and Rodriguez Elementary. With the opportunity to apply an additional year, the district may be eligible for up to $3 million in funding over a two-year period. After-school programming will target academics and wellness impacting performance, attendance, discipline, and advancement as well as bring a focus to students with special needs and provide family support in literacy and parenting skills. 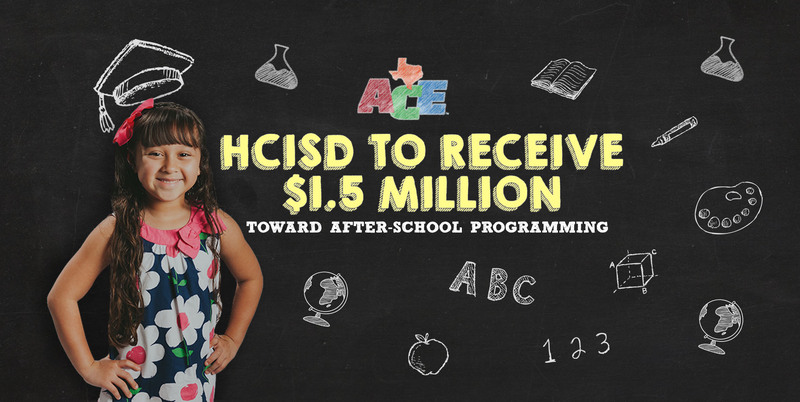 The funds along with HCISD’s partnership with the Boys and Girls Club will impact a minimum of 1,400 students a year. Texas ACE programs are designed to provide students with a safe additional learning opportunity while school is not in session. The programs are free for participants. This is the tenth cohort of the grants TEA has awarded since the federal program’s authorization in 2002. Grant funding will begin on Aug. 1, 2018, and run through July 2021.